In 1887 an american businessman Jonas Gilman Clark gave £1m to found a new private, non-profit university in the city of Worcester, Massachusetts. 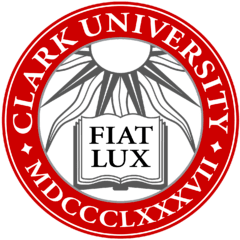 Clark University was the first all-graduate university in the USA specialising in psychology, biology, physics and chemistry then. It was also one of the first research universities to open on the continent. Although small in terms of student numbers, the university retains an excellent reputation for its research. The Clark University experience is distinguished by a transformative liberal arts education in a research university setting, purposeful engagement in local and world communities and an inclusive environment in which active learning and personal connections are hallmarks. As well as the original founding schools, Clark University has grown its capacity over the years and now offers 32 undergraduate majors, 12 master’s degree programs, 4 dual masters programs and 8 PhD programs. The campus is a collection of old red brick buildings spread over one city block about 2 miles from downtown Worcester and only 40 miles from the city of Boston. Worcester is the second largest city in New England and is a centre for healthcare, financial services, biotechnology and higher education. The dynamic environment means Clark University students are well placed for internships, professional placements and jobs after graduation. The small size of the university is intended to make for a positive learning experience with a high faculty to student ratio. Alumni include two Pulitzer Prize winners and an Emmy Award recipient. Fred S. Anton – Executive Officer of Warner Bros. and Matthew Goldman - cofounder of the performance art Blue Man Group, also studied here. The university is also the alma mater of at least three living billionaires. The 2017 edition of U.S. News & World Report’s Best Colleges guide recognizes Clark University’s outstanding academics and financial value, ranking Clark at No. 74 among National Universities and No. 27 on the list of Best Value Schools. The university now offers 46 majors, minors and concentrations in the humanities, social sciences, natural sciences, and engineering. It allows students to design specialized majors and engage in pre-professional programs. In recent years, Clark has been noted especially for its geography and psychology departments, with the latter having a distinctive humanistic orientation. As a liberal arts-based research university, Clark makes substantial research opportunities available to its students. The most popular majors by the number of registered students are psychology, political science and government, biology, economics, business administration and management, communications. The campus is located on Main Street in the Main South neighborhood about 2 miles (3.2 km) west of downtown Worcester and 40 miles (64 km) west of Boston.